At first the European single currency rose against the dollar, but then decreased and as a result it finished the session with a level of 1.2190-1.2200 breakthrough down. We expect that the third quarter final GDP assessment will show the before announced 0.3% q/q, while the consumer spending showed the growth in November by 0.6% m/m vs. -0.9% m/m in October. We expected the US GDP data publication. The pair euro/dollar initially rose slowly to the resistance around 1.2270-1.2290, then turned back and slowly fell to the support near 1.2180-1.2200 and broke it downwards. This tendency may remain in the coming days, but there are possible sharp movements in either direction due to the low liquidity. 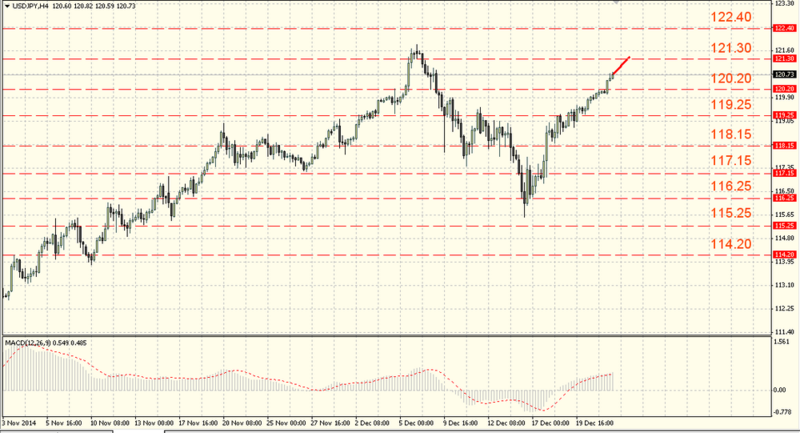 The support levels are 1.2120-1.2140, and the resistance levels are 1.2200-1.2220. The EUR/USD can test 1.2120-1.2140, the level breakthrough will open the way to 1.2000. The British pound as well as the euro started to strengthen against the dollar, but finished the trading day with losses. The final data about the UK GDP changes in the 3rd quarter are forecasted to be unchanged, 0.7% q/q, 3.0% y/y. The current account payment balance for the third quarter with the deficit increase to -23.1 billion pounds against the earlier -21.1 billion pounds. The BBA mortgage lending for November with reduction to 37.1 thousand after 37.3 thousand in October. Although the pair declined, falling from the resistance around 1.5650-1.5670 to the support around 1.5510-1.5530, having nearly 100 points, but this movement was not so different in dynamics. Pressure on the pair is preserved. 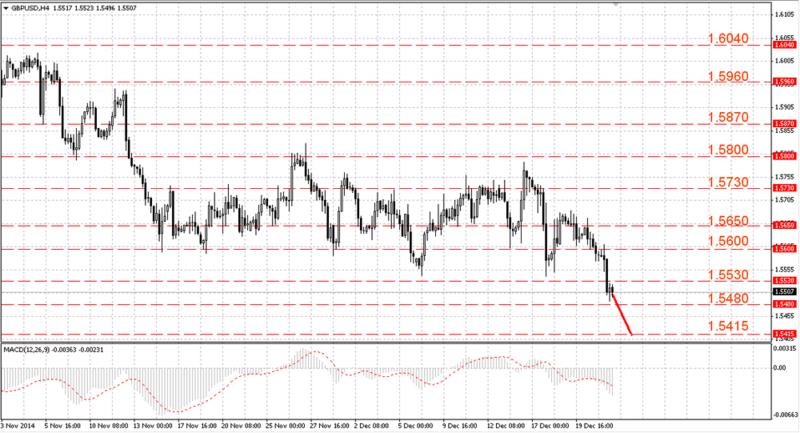 The support levels are 1.5460-1.5480, and the resistance levels are 1.5530 – 1.5550. 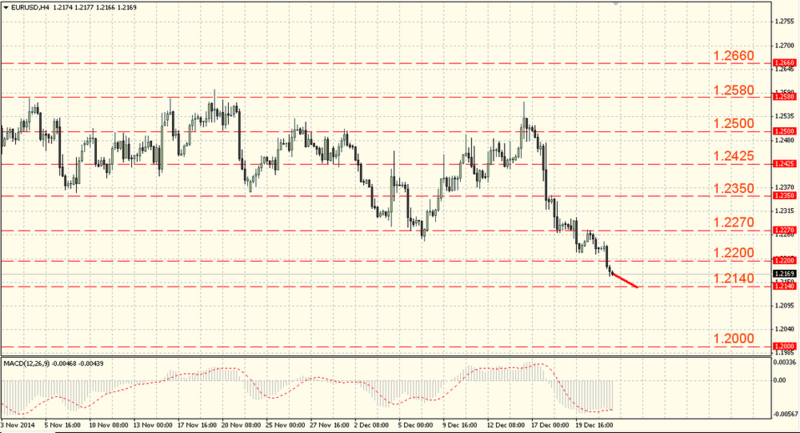 The pair can test the support around 1.5460-1.5480 in a short term. The Japanese yen continued to decline slowly but surely against the dollar. Mood, formed earlier by the Fed statements, indicating the Central Bank multi-directional policy increase continue to support sales for the dollar against the yen. There was no Japan news as there was non-working day in connection with the Emperor’s Birthday. The pair USD/JPY continued to grow and tested the resistance around 120.20-120.40. Bulls managed to break through it. Undoubtedly, the downtrend within the yen is still in force, although we should not exclude the dollar and the yen rebounds below the level.